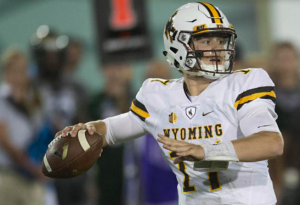 As expected, Wyoming quarterback Josh Allen will forgo his senior season and enter the 2018 NFL Draft. Allen made it official after helping his team to a win over Central Michigan in the Famous Idaho Potato Bowl on Friday. With many expecting Allen to be one of the first quarterback selected, leaving for the NFL was an easy choice. Allen announced his intentions to leave while the Cowboys were on stage after the game accepting their trophy as Famous Idaho Potato Bowl champions. Against Central Michigan, Allen was 11 for 19 for 154 yards. The Cowboys won the game easily, 37-14, so Allen wasn’t asked to do too much. But his impressive arm strength and raw talent were definitely on display, especially on his three touchdown passes. Allen closed out the season with over 1,800 yards passing with 16 touchdowns and six touchdowns. He considered leaving for the NFL after last season. But coming back for one more year and earning his degree before going to the NFL was always part of Allen’s plan. Of course, the fact that Allen played in the bowl game bucks the recent trend of top prospects sitting out bowl season. Allen actually battled a shoulder injury late in the year that caused him to miss Wyoming’s final two regular season games. But he was intent on getting back for the bowl game, not just to showcase himself for NFL teams, but out of respect for the Wyoming coaches and players. Allen’s attitude and approach to playing in his team’s bowl game certainly won’t hurt him with NFL teams looking for a quarterback in next year’s draft. Cowboys head coach Craig Bohl was also appreciative of Allen’s desire to play against Central Michigan. Of course, exactly where Allen falls in the draft remains to be seen. At the moment, most talent evaluators view him as behind USC’s Sam Darnold and UCLA’s Josh Rosen as the third best draft-eligible quarterback. In any event, Allen is almost a lock to be a first-round pick. At least one NFL team is likely to view him as their quarterback of the future.